I don’t make it out to Andersonville that much and am close to some really good sushi places in my neck of the woods. But I wanted to try Ora as I heard it was really delicious and I like that it’s BYOB. The food here was very flavorful and high-quality. The service here though could be improved. They don’t seem to have their act quite together. It was a busy Saturday night. I made reservations ahead of time and we got there right in time for our reservations. We had to wait there for 30 minutes because they didn’t have anything ready and two of their servers/staff members were kind of snippy telling us to wait in a corner and telling my friend to wait in a separate part of the room in an abrupt way. I understand the place is small, but this is a restaurant so they need to be nice to people who are already pissed off about having to wait when they made reservations. It’s also too cold to wait outside when it’s 38 degrees. One of the servers was very nice though and was a stark contrast to most of the other servers we interacted with there. He was our primary server and kept apologizing for the wait. The wine glasses took forever to come out and he just brought one of them out after we waited abut 15 minutes already because he said the other glasses were still drying. They need to order more wine glasses then because it was a long wait to just have glasses served. Our server seemed completely overwhelmed and it took him awhile to come back with items. The guy who was taking our plates was kind of rude though and we asked him nicely for a cork to open our wine bottle and he never brought it, he was basically rushing us and taking plates away without asking whether they were ready. It’s kind of a pet peeve of mine since I am a slow eater. The food on the other hand was excellent. We ordered the highly recommended Oyster Motoyaki. It was basically oysters soaked in an egg custard with garlic flakes, ponzu and green onion sprinkled on top with a soy vinaigrette. It was baked and oozing with flavor. This dish definitely lived up to the hype and is an extremely unique dish conceptually. We decided to share some Maki and ordered the: Scallop Volcano roll, Smoke Eye roll, and Dynamite roll. All of these rolls had remarkable flavors with a multiplicity of textures. The Scallop Volcano roll was my favorite as it had smoked salmon, shrimp tempura, grilled scallions, a soy reduction, and spicy scallops on top. All of the flavors balanced out very well into an extremely satisfying large bite of food. The Smoke Eye roll was unique and delightful as well. My favorite part of it was the seared eel as it adds a nice salty flavor to the shiitake, tiger prawn, wasabi aioli, and fish stick bits. There was a lot of umami in this roll. It is also finished up nicely with a soy reduction. 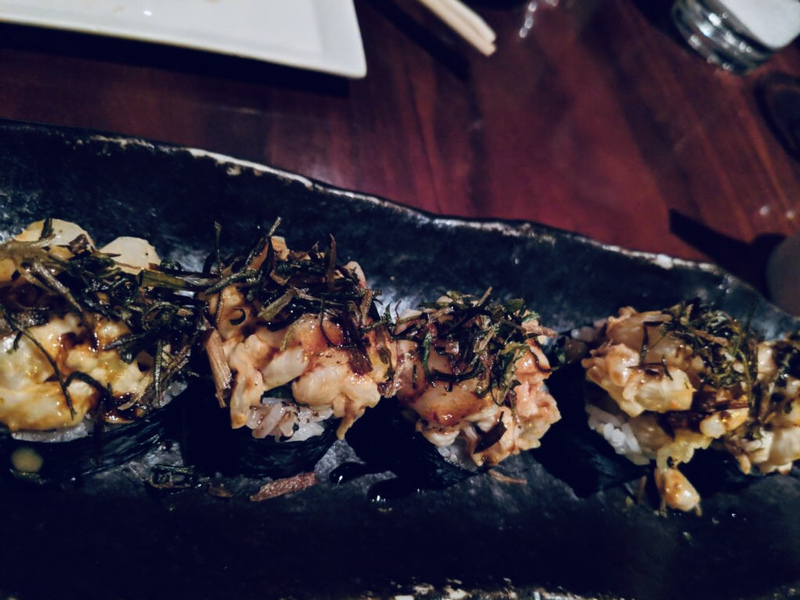 The Dynamite roll had that perfect crunchy texture complementing the soft baked scallops on top. It came with asparagus, tuna, and cream cheese. Fortunately, the cream cheese did not dominate the flavors as it does sometimes at other sushi restaurants. It tasted fresh and I enjoyed all of the tempura flakes. I am a firm believer in trying a sushi restaurant’s nigiri or sashimi because that is the purest way to really assess the quality of their fish/rice. I ordered the Smoked Mackerel Nigiri. The rice was nicely sticky (I am not an expert on sushi rice though). Also, the smoked mackerel was light, delicate, and subtly smoked. Since we had to wait awhile for everything and the service was a bit rough, our server was kind of enough to serve us a spicy tuna maki on the house, which was very appreciated. It had a completely different flavor profile from the maki we previous tried and I really enjoyed the spice of the tuna. It was a very satisfying roll. I do think the sushi here is really spectacular and it is affordable for a high quality sushi place, especially since it’s BYOB. Their service needs to improve though because most of the people that we interacted with were not pleasant and the slowness of everything really took away from the experience. I probably won’t come here on a weekend night again if I do come all the way up to Andersonville for sushi.